I've been pestering you guys with questions about how to set up some public display tanks for the last several weeks, so I figured I might as well show you what's happening with them. 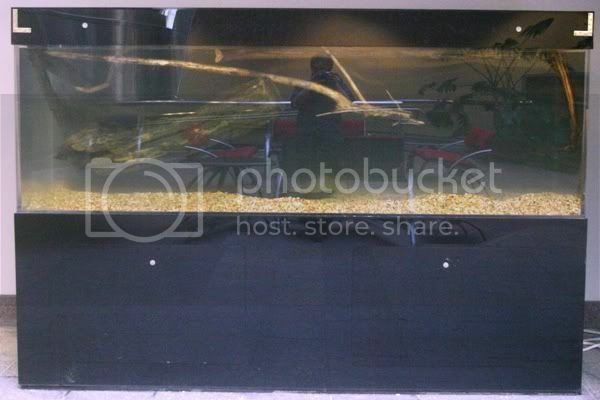 These two large acrylic tanks are in the lobby of the science building at the university where I work. Formerly the smaller of the two (120 gallon bowfront corner tank) was set up as a freshwater tank with two large plecos, a school of giant danios, and two half-grown red-eared sliders; the larger (ca. 500 gallon rectangular tank) was set up as a saltwater reef tank. But eventually the tank inhabitants were relocated, and the tanks have been sitting empty for some time. Now, a student chapter of the Wildlife Society has started up at the university and has just secured funding to renovate the tanks and set them up with native flora and fauna. I have been sort of an unofficial advisor for the club, and have ended up in charge of the tank setups. We have been planning, cleaning out the tanks, and waiting for the funding to come in. Now that we have it, the real fun begins! We made some of the first significant additions to the large tank today. We washed and added to the tank ca. 3 cu. ft. of pea gravel, purchased at a local home center. We also added several pieces of driftwood, collected from the Cumberland River. Then we filled the tank, to allow the driftwood to become waterlogged and some of the tannins to leach out. We will drain and refill the tank a few times to get rid of some of the tannins and detritus. Then we will add 3-4 cu. ft. of mixed topsoil and leaves, plant some Vallisneria, Potamogeton, and other typical plants of our local streams and reservoirs, top off the soil with creek gravel and stones, situate the driftwood in its permanent arrangement, and refill the tank. Some kind of reddish-leaved aquatic knotweed (Polygonum); I can't get a positive ID on it until it decides to bloom. 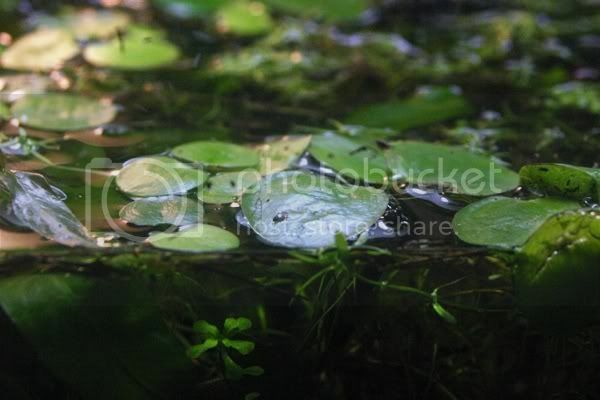 Some American Frogbit (Limnobium spongia), kindly sent to me by Nativeplanter. 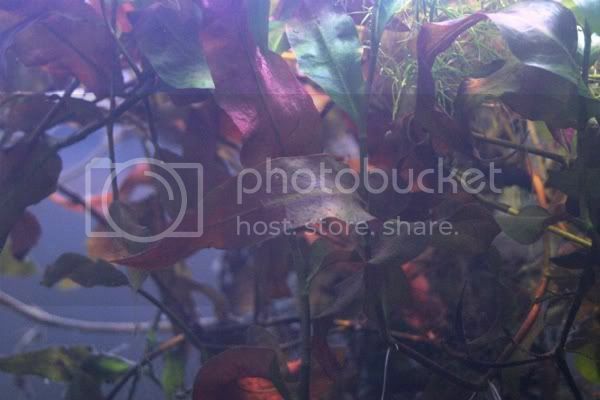 These are all swamp plants moreso than riverine plants, and will be transferred to the other aquarium when they have done their work in the big tank. The corner tank will be set up as a paludarium and feature flora and fauna of our river swamps, oxbows, and sloughs. Edited by Newt, 21 March 2008 - 05:28 PM. That look's great, can't wait to see them finished. What variety of fish will be going in these tank's. The tannins will always be with you unless you seal the driftwood. Oh yeah, you'll get 'em from the soil and leaves too. Keep in mind that this will cut down on the amount of light your plants will receive. Thanks, Irate. I hope the weekly water changes will keep the tannins manageable, but I don't expect the water ever to be crystal clear. Wouldn't look much like the 'Scumberland' then, anyways. Octavio- The big tank will be home to a variety of sunfishes, madtoms, chubs, and shiners, and perhaps also some suckers, crayfish, drum, yellow bass, etc. The smaller tank will have various hylid frogs, mole salamanders, lesser sirens, pirate perch, and perhaps other small swamp dwellers. Sounds really cool! I'm envious. I'd love a project like that, especially if someone else was paying the bill. Depending on what species you keep, you may find the tannins help them show best color. It's true the tannin will cut down on light but I think if you go with low light plants and plenty of illumination you'll be OK. Also several of your plants will probably grow emerged so will get lots of light. Also GAC will keep the color out of the water if you keep enough and replenish frequently. Thanks, Michael. That makes sense. I probably won't bother with carbon though. Granulated Activated Carbon, AKA "charcoal" and close reletive of PAC, or Powdered Activated Carbon. Sorry for the confusion. It's a common water treatment abbreviation. I talk in Water Treatment language all day long with other people who also speak the language. So many of the terms carry over to fish keeping that I sometimes mix the two. You can always have a canister filter hooked up full time and just add carbon on occasion to take the color out when it gets too yellow. Not everyone likes the yellow for aesthetic reasons and it does cut light a small amount. I don't use carbon and don't mind the tannic color. 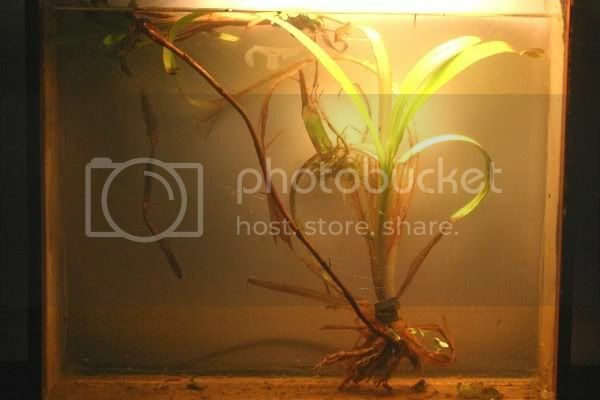 I encourage it in my "Swamp" tank with driftwood, oak leaves and peat moss. I did a water change the other day and saw my tank water in a white bucket and was amazed at the color. Almost tea colored. Thanks, Mike. This tank has a built-in spill-over filter (sort of a false back arrangement), with plenty of space in it for a container of charcoal. I guess I could just stuff one in if the discoloration gets to be too much. The trouble with this whole thing is that I won't be taking care of it after the first few months. And while I'm certainly no aquarium expert, the kids I'm leaving this to know even less. So I'm trying to keep it simple and leave them clear instructions; I'll train a few of them (and hopefully a couple of faculty members) up before I'm done working here. My worry with carbon is that they would just leave it in indefinitely, which sort of defeats the point. But people probably will complain about the "dirty water", so I guess I better figure out a simple carbon treatment regimen; if it were my own tank I would just let the tannins stay. A couple of years ago I was working on a herp survey at a national battlefield where they were trying to establish some native warm-season grasses. People griped about the "unmowed grass" all day long! There's just no pleasing some people. Since it's an educational tank, you can always put up signs (in fact, some signs might be nice in your situation anyway). Something like: "Why does the water look brown"? Then you can launch into a nature story about tannins. That's a good suggestion. There will be a display monitor with a looped slideshow on it next to the tank, so we can just insert a slide about it. Thanks, Nativeplanter! I had hoped to add soil, rocks, and plants to the tanks earlier this week, but the nasty weather prevented me from getting the soil and rocks. Hopefully I'll be able to get all that done this week. The university president, who is funding all this, came by and looked at the tank; it's not too appealing right now, with the lights off, no living inhabitants, and a bunch of driftwood floating in it. I wasn't there, but apparently he said, "I wish you had made this saltwater." He expressed concerns that the tank would be drab and uninteresting. So I had to make a powerpoint slideshow showing off some of the pretty plants and animals that will go into the big fish tank and the paludarium, and explaining that we live in an area of very high aquatic biodiversity and how it would be educational for students and visitors alike. He hasn't seen it yet. I'm just going to proceed as though this never happened and we'll just have to see how things play out. All right, some Wildlife Society members and I just finished aquascaping the tank. I got in the tank, and they handed me materials. Pictures coming soon. I added a big bag of leaves (mostly oak, with some maple, beech, elm, cherry, dogwood, etc. for flavor), about 4.5 cubic feet of woodland topsoil, about 6 cubic feet of creek gravel and cobble, and a few chunks of limestone and fossilized coral, to join the driftwood already in there. The leaves contained a few surprises, mainly of the hemipterous variety. 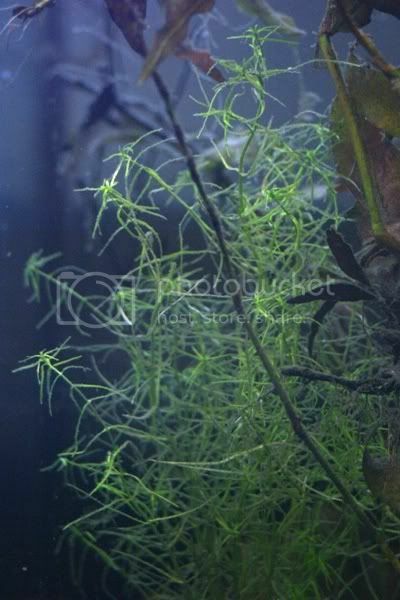 Then I planted about 30 small Vallisneria americana. I filled the tank with tap water, treated with Prime. The substrate is ridiculously deep. I hope I didn't overdo it. I'm going to let the dirt settle for a day or so before I turn the pumps on. Then we shall see what we shall see. Added a bucket of scuds, cladocerans and pond snails; hopefully they'll get well established before the fish arrive. I'm working on the lighting tonight, which involves a lot of re-working the poorly-designed acrylic canopy. I'm beginning to think it would be worthwhile to rebuild the canopy from plywood. My next big project will likely be a 125 or 180(72" in either case), native "blackwater" tank, full of Enneacanthus sunnies, smaller Lepomis such as oragnspotted and bantam, (will leave those out however, if they will be a major problem)various shiners, top minnows, mud minnows, slower water darters, (who knows..maybe even have a single powerhead in some corner to make a "stream inlet" and have rainbows! ), and anything else along those lines I can think of. I want it full of life, so before the fish go in I plan on getting it planted, up and running for at least a week or so prior to fish, and putting in lots of isopods, dwarf crayfish, and other assorted microfauna. Anyway...this thread is an inspiration! I'm glad you're enjoying it! I was beginning to think no one was even reading it anymore. Good luck with your tank. This is my first big tank, so it's really been a learning experience for me. Hopefully next week I can track down all the photos various people have taken during the renovation and put them up here, since this is after all in the Photo Gallery. I'm reading. I'd like to see pictures of the substrate if you have any. I'm reading as well, just haven't had much to say. I'm about to do a big project as well, just not an indoor tank. I'm going to build a pond (probably in the 15-20ft diameter range) in my backyard. I'll get some photos up early next week, with any luck. Fishlvr- How are you going to seal the pond? Clay, concrete, hog, or just a giant liner? I've made a couple of little bitty ponds and water features, but nothing on that scale. Edited by Newt, 12 April 2008 - 01:31 PM.